I’ve had mixed experience with Mitch Albom. I liked The Five People You Meet In Heaven, but didn’t like The Time Keeper nearly as well. I loved The First Phone Call from Heaven, but was disappointed by his most famous book, Tuesdays with Morrie. 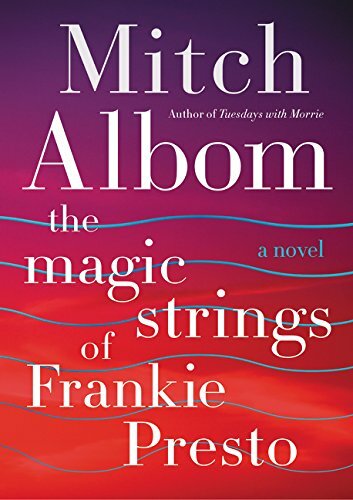 All the same, when I saw his latest, The Magic Strings of Frankie Presto, sitting on the shelf at the library, I picked it up on an impulse–and it was great! The story begins at the funeral of Frankie Presto, one of the great disciples of Music. And while we wait for the funeral to begin, Music is going to narrate Frankie’s life for us, intercutting between stories from Music, and interviews with music legends who have all come out to pay their last respects. The story that unfolds takes us from Spain to London to New Orleans to New Zealand, and through almost a century of music, from the 1930s on up to the present. Frankie is a guitar player who, in Forrest Gump fashion, manages to intersect with the major musical trends of the 20th century, from Duke Ellington to Elvis to Woodstock to KISS, with plenty of jazz and country and classical thrown in besides. Plus there’s a magical twist–Frankie has six magic guitar strings, which will change six lives. This was a deeply clever book with a wonderful story. I loved Music as the narrator, a mythological figure who speaks of his/her disciples across the years, who tells about how we all take a grab at a chosen talent at birth, and who tells Frankie’s life as a symphony, with appropriate musical metaphors throughout. Frankie’s life is tumultuous and adventurous, ranging around the world and across the decades. It’s not an easy life, with more than its share of tragedies, but I didn’t feel this was a sad book. The tragedies never overwhelm, and Frankie is always ultimately sustained by his two great loves, his beloved Aurora and, of course, Music…even though he has some tumultuous times with both. Some aspects of Frankie’s life are pretty implausible, although a very late in the book explanation accounts for some of that (while being itself fairly implausible). That never really bothered me though–I just took it as truth for this world, another kind of magic like Frankie’s guitar strings. Interestingly, the strings were the hook for this book, but they ended up being just one element. It was really more the lives and musical movements Frankie intersects with, and how he grows and changes himself, that was most interesting. The Libriomancer series has a wonderful way of referencing my favorite books. This didn’t reference my favorite musicians, but I recognized enough to follow along and still enjoy the trick of inserting Frankie into history. I can only imagine this would be an even more delightful book for someone who does love the musicians who appear here. It was pretty delightful anyway, though–I may have a contender here for Most Surprising in a Good Way, at my end of the year round-up! No, but I kept thinking of it!